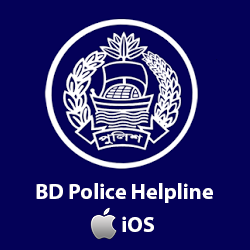 Dhaka Metropolitan police (DMP) came into being on 1st February 1976. Mr. E.A Chowdhury served as its first Commissioner while Mr. A.S.M. Shahjahan (later on made IGP, Secretary and Advisor to the Caretaker Government) as the Deputy Commissioner (HQ) and they jointly worked hard to setup an effective and professional Metropolitan Police. DMP started its journey with 12 police stations and 6,000 forces in 1976. Now, the total number of police station is 49, and they are -- Adabor, Airport, Badda, Banani, Bangshal, Bhashantek, Cantonment, Chackbazar, Darussalam, Daskhinkhan, Demra, Dhanmondi, Gandaria, Gulshan, Hazaribag, Jatrabari, Kadamtoli, Kafrul, Kalabagan, Kamrangirchar, Khilgaon, Khilkhet, Kotwali, Lalbag, Mirpur Model, Mohammadpur, Motijheel, Mugda, New Market, Pallabi, Paltan Model, Ramna Model, Rampura, Rupnagar, Sabujbag, Shah ali, Shahbag, Sherebanglanagar, Shyampur, Sutrapur, Shahjahanpur, Tejgaon, Tejgaon I/A, Turag, Uttara Model, Uttarkhan, Uttara West, Vatara and Wari. At present, the total strength of DMP (all ranks and status) is more than 26000. 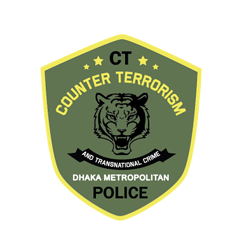 Chittagong Metropolitan Police, established in November 30, 1978, is one of the most important units of Bangladesh police. It has a jurisdiction on an area of 304,66 sq km and serves the people with 08 circles, 16 police stations -- Kotwali, Chandgaon, Panchlaish, Doublemooring, Pahartali, Bandar, Baijid bostami, Hali Shohor, Kornafuli, Potenga, Bakolia, Akborsha, Shodhorgat, EPZ, Chokbazar and Kulshi. It has also 30 police outposts, 6 police boxes, 2 crime divisions -- North and Port; headquarters division, 1 city special branch, 5 investigation centers including 4 naval and 1 police box and 2 traffic division. CMP has a glorious role in the liberation war of Bangladesh. In 1971, the then SP martyr Shamsul Hoque led his fellow freedom fighters from police force during the fight with the Pakistani Army. Khulna Metropolitan Police (KMP), covering a total land area of 70 sq km, came into force on 1st July, 1986. Thirty one wards of Khulna City Corporation and its three unions fall under its jurisdiction. 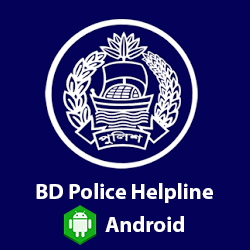 Khulna Metropolitan Police (KMP) consists of 08 police stations -- Khulna Sadar, Sonadangha, Khalishpur, Daulatpur, Khanjahan Ali, Labanchora, Horintana and Aranghata. Khulna city, which was once known as safe heaven for different terrorist organizations, has become a safe city now by dint of active and smooth functioning of Khulna Metropolitan Police. Established in July 1, 1992, RMP has a jurisdiction of 203 sq km for 20,10,020 people, covering Rajshahi City Corporation, Katakhlai and Nowhata municipalities, parts of Horian, Parila, Horipur, Damkura, Borogachi unions under Poba upazila. RMP Commissioner is supervising 5 RMP departments -- 1 headquarter, 2 crime department (east & west) , 1 CTSB, 1 Riot Police Department. Besides, there are 4 police stations, 12 police posts and 3 police boxes under RMP. The police stations are Boalia model, Rajpara, Motihar and Shahmokhdum. 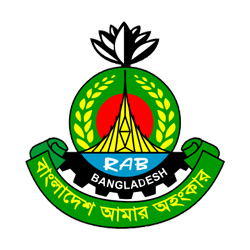 Barisal Metropolitan Police became functional in October 26, 2006 under the Barisal Metropolitan Police Act-2009. Barisal, an area enriched with paddy, rivers and cannels, was formerly known as Bakla Chandradip. Now, Barisal is a divisional headquarter and an important river port. Barisal police made a significant contribution to the Liberation War of the country. Veteran freedom fighter Mohammad Mahbub Uddin Ahmed, Superintendent of Police, received "Bir Bikram" for his gallantry role in freedom fighting with Pak occupation forces. Martyred freedom fighters of Barisal police includes, among others, Additional SP Golam Ahmed, Inspector Golam Rabbani, SI Abdul Karim Hawlader, constables Abdul Karim Ali, Jalal Ahmed Sharif, Mahbubur Rahman, Mujibul Haque and Sayed Abdur Rashid. BMP has 4 police stations: Kotowali model, Airport PS, Kawnia and Bondor PS.